Cushion pairs really well with some of the most popular services in the freelancing world, including Harvest, FreshBooks, and FreeAgent. Today, I’m excited to add another well-known name to that list—Xero, the accounting software used by over 600,000 individuals worldwide. 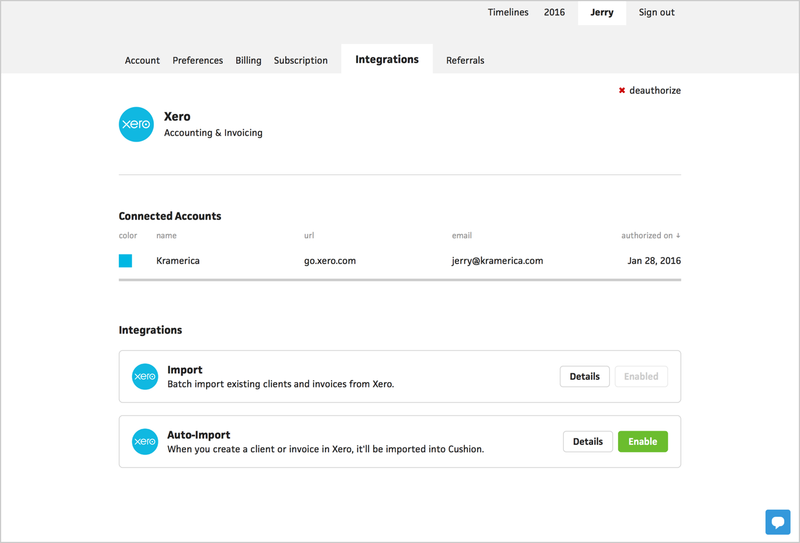 Xero brings two new integrations to Cushion—Batch Import and Auto-Import. With Batch Import, you can pull in a handful of existing clients and invoices from Xero all at once. Then, with the Auto-Import integration, Cushion will automatically pull in any new clients, invoices, and payments created in Xero. Xero is the latest integration for Cushion, but expect many more down the road. Next on the list is Zapier, which will open the floodgates to any service that connects to Zapier. Stay tuned!